“I am waiting”. This is an affirmative statement expressing the hope for a future return. A promise of love too, as we truly wait for those we love. A garden is a pleasant space of affections, of endless encounters and farewells, where time goes by at a different pace, in a free, emotional plane. Even when the cold season leaves gardens deserted, there is always the anticipation of coming back. That is why the bushes blooming by the bench are also waiting for us. Fernanda Fragateiro built a personal, private world in Jardim D. Maria II. 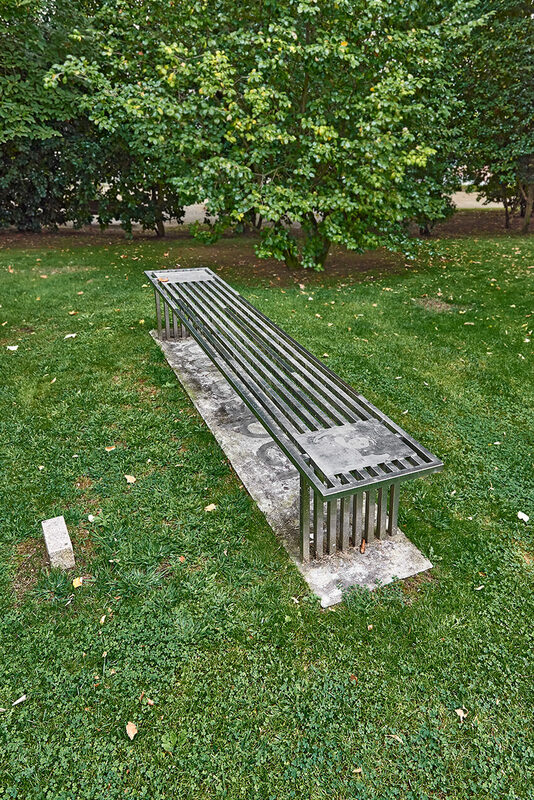 This piece has symbolic and sentimental value, due to the ambiguous gesture that transformed this “bench” into a work of art. For Fragateiro, objects are a vehicle to convey ideas, so that every element becomes a quotation weaving a text with multiple readings, in which cultural references are combined with personal sensations. Anybody who has felt the need to sit down to stifle a painful longing can easily understand the meaning of this sculpture. But does waiting mean the same to everyone? What does it mean to Fernanda Fragateiro? The reproduction of a late 19th-century photograph by Julia Margaret Cameron (English pioneer of portrait photography), featuring a close-up of her niece, Rachel Gurney, wearing angel’s wings; the cold stainless steel bench and its distance from the trail — they are all personal clues planted by the author, which demand a different type of waiting, and appeal to the beholder’s sensitivity to read this unusual piece.